The Port of Kiel has acquired a 3.2- hectare commercial site with warehousing from Agrar Terminal Peter Rothe GmbH & Co. KG, which lies right next to the Ostuferhafen. The warehouse boasts more than 18,500m2 of usable floor area as well as an office building and waterfront loading facilities. The Managing Director of the Port of Kiel (SEEHAFEN KIEL GmbH & Co. KG), Dr Dirk Claus, said: “This is a further important step in the development of the Ostuferhafen. Because of our currently very good work load, this expansion of the port is taking place at just the right time.” The extension of warehousing capacity is of particular significance given that demand for it is rising continuously. “This year alone”, commented Dirk Claus,“we are taking an additional 50,000m2 of warehousing space into operation. Our overall capacity will more than double as a result”. In the newly acquired warehouse, grain will continue to be stored for the time being along with pellets and, later, sawn timber. 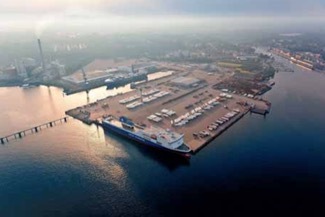 Claus said:“This additional warehouse capacity strengthens our liner shipping services to and from eastern Europe and sends a strong signal to our timber customers.” The Ostuferhafen was built in the mid 1980s on the site of a former shipyard and has been transformed to date in five development phases into a freight and logistics hub for the commercial Port of Kiel. At that time the adjacent property with its flat-roofed storage hall was first sold by the City of Kiel and not transferred into the ownership of the Port of Kiel. “I am very happy that the SEEHAFEN KIEL has now had the chance to acquire this site, which is so important for the further development of the port”, said Claus. With this most recent site extension, Kiel is underscoring the universal character of its port in order to offer all its customers possibilities for expanding business. business the port will in future also be served two to three times a week by SCA RoRo ships from Sundsvall in northern Sweden or, via the Kiel Canal, from the Benelux countries and England. In addition bulk cargo like grain or coal and containers are handled, along with heavy cargo and project loads. Last year more than 2.6 million tonnes of cargo were loaded or unloaded in the Ostuferhafen.